This is one episode I will never forget as it almost stopped our dream even before it began... read on for this electrifying story. After 4 years of preparation by my new owners, Bob and Judi, we were finally headed into the open ocean to set off on our dream. They still didn't know how to properly sail me, but I had confidence in them and their abilities. My boat pals and I had been eagerly waiting in port as we watched several weather fronts pass by, but finally, the skipper decided the time was right to head out and get across the Gulf Stream. Bob stood proudly at my helm as he steered out of the inlet at Beaufort, North Carolina. My bow pitched and yawed in the moderate seas, but I was reveling in the conditions and, at long last, was able to fill my sails and show them what I could really do. We were about 8 days out - still 2 days from the Virgin Islands and had encountered squally, blustery conditions for several days. My decks were awash with water from going to windward, but we were all handling the conditions well. Bob and Judi had set up our newest crew member, Betsy, the Monitor windvane and we were both doing our best to pick our way through the really big waves. That evening, when my skipper checked in with Herb, he was told of a nasty low pressure system right in our path, so Bob made the decision to alter course to the West to try to miss the worst of it. Unfortunately, that strategy did not work and around midnight we sailed right into the heart of the storm. Even with my experience with New England nor'easters and gales, this was one of the worst lightning storms I had ever encountered. With winds gusting up to 40 knots, Bob, took over the helm from Betsy and hand-steered while Judi bailed, as the rain was coming down so hard that it had started to fill up the cockpit. 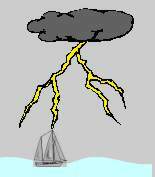 The lightning was continuous, like a strobe light, with bolts striking the water all around my hull and illuminating the huge seas around us. Tumultuous cracks of thunder were coming right on top of the flashes. It was just a matter of time before we were hit and, sure enough, one tremendous bolt did finally strike the top of my mast - Ouch! that really hurt. Judi felt a slight charge as she was scooping up some water and Bob saw sparks fly from the VHF antenna, but felt nothing as he was holding my wooden wheel in a "death-grip.". After first checking to see if they were both in one piece, Judi went below to check for damage to me. Fortunately, all my thru-hull fittings were intact and I was not taking on water. But, we were not totally unscathed, as the next drama highlighted. As Bob checked the battery charging instruments, he saw that they were being drained very quickly; so in spite of the storm raging around us, he had to tear apart the battery compartment to find the problem. It seems that the shore-side battery charger was damaged by the strike, was shorting-out and draining the batteries. Since we certainly did not need the charger, Bob quickly disconnected it and that solved the problem. Depth and Knotmeter instruments, not working. In spite of this, we were all counting our blessings as we were all alive and OK. The thru-hull fittings on my hull have all been bonded together and the skipper is still not 100% sure if that is the reason we sustained no damage, but he has decided not to fool with success, even after reading everything he could on the subject later in port. After 2 months in St. Thomas replacing the damaged items, we were again on our way to cruise the Caribbean and continue with our dream. I had my doubts about them during this time, as I worried about whether they would pack-it-in, but after a few weeks in a beautiful tropical location, the bad memories faded away. Learn about the weather in your area. We thought that these fronts would quickly move away in a day as they do in the northern latitudes, when, in fact, in the sub-tropical latitudes, the systems tend to move west to east more slowly and frequently stall. Bond the rigging to create a "cone of protection"
During lightning storms, disconnect electronics, where possible. If possible, keep in daily radio contact with another boat or someone like "Herb" on shore. Where possible, have back-up instruments. We now have both a manual wind-instrument and spare depth sounder and both a Ham radio and a SSB radio.